ESC32 V3 is rated for max 42 volts input with 40A constant current with sufficient cooling. Bench testing has shown that power levels of more than 1500 watts is possible with special attention to cooling. But in the end, the actual power attainable in a specific setup depends highly on how good the ESC´s are cooled and where they are mounted. At lower loads under 250 watts peak ESC32v3 can generally run most motors without any need for cooling. But you should always test your individual setup and if the ESCs heat up under normal operation, you should add more cooling. ESC32v3 will continue to operate up to around 80 degrees Celsius. But continued exposure to high temperature will decrease efficiency and increase the risk of failure. So it is strongly recommend to keep the ESC temperatures well under 60 degrees Celsius to keep them running efficiently and decrease risk of parts failure. The better cooled they are the more efficient they will also be. The best way to keep ESC´s cool in a multirotor, is to place them in the direct airflow from the rotors. In most cases this will cool the ESC´s sufficiently even at very high loads. In frames where mounting the ESC´s in propwash is not possible because of design considerations or if running extreme loads, you should add a suitable heatsink to the FET´s. Active Freewheeling can create heat in the input capacitor as the capacitors are rapidly charged and discharged as the motor changes speed in flight. Keep an eye on capacitor temps and take steps to cool them if necessary. The telemetry of the ESC V3 has a field that shows the main processors temperature and it can be used to see if your ESC´s are running hot. ESC32 V3 has an absolute factory limit of 50A and a user settable current limiter which is set a default of 20A. Bear in mind that the wide input voltage range means that a default limit of 20A at 42V is a power potential of 840 Watts, while on 12V, 20A is “just” 240 Watts. The current limiters job is to protect the ESC and motor from overload that could damage motor and ESC or cause commutation failures. If an overcurrent event is detected, the power is limited in real time by reducing the motor voltage. Working out an appropiate limit for your particular motor and prop is important. To do this, you can use the AutoQuad ECU or the CLI to test your motor and prop combination and monitor the actual current consumed. 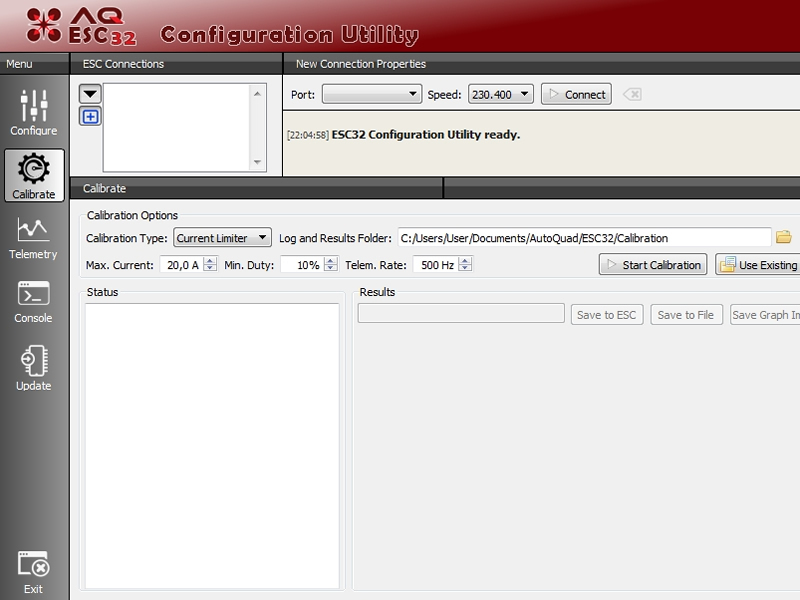 Connect the ESC and bring up the telemetry view in the AutoQuad ECU or the CLI. This tells us that the motor consumes 11.55A at full speed and has a peak current of 15.43A to accelerate rapidly up to full speed. Allowing a 10% overhead, a current limit og 17A is set to allow enough current to both be able to accelerate rapidly to full speed and maintain it. This page was created on 11-Aug-15 by jussi. Last modified on 21-Aug-15 by kinderkram.